Meringue used to be my favorite when I was little. It is a type of dessert made from whipped egg whites and sugar. 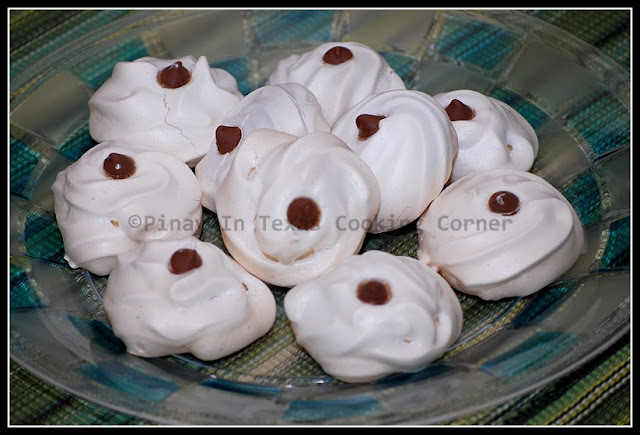 In the Philippines, meringue is a popular kiss-shaped dessert available in almost all bakeshops and sari-sari stores. Its melt-in-your-mouth goodness makes the whole family love it. Meringue is fun to make, easy to bake and a guilt-free treat. Try it! 1. Preheat oven to 275F. 2. 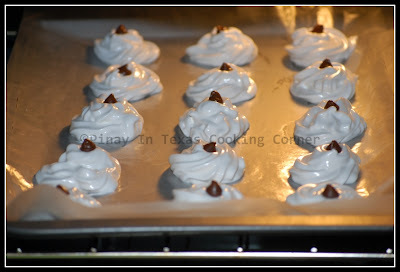 Line two cookie sheets with parchment or wax paper. Set aside. 3. 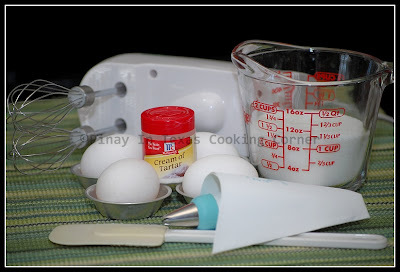 In a clean bowl, combine egg whites and cream of tartar. Beat at high speed until frothy. Gradually add the sugar and beat until whites are glossy and stand in stiff peaks. 4. Fill a pastry bag fitted with a 1/2 inch star tube. Pipe 1 ½ inch stars, 2 inches apart, into the cookie sheet. Top with chocolate morsels. 5. Bake for 30 to 35 minutes or until crisp and lightly golden. Note: Store leftover meringue in an airtight container. Where yours sticky after they already cooled down? No. But if you don't store them in an airtight container after a few hours, they will be.